Spring is just around the corner here in North Texas, and with the deadly tornadoes in Arkansas this past week, it’s important to remember that we need to be aware of the Spring storm season ahead of us and we need to get prepared. Make sure your house is secured and ready for storm weather. Inspect roofs from last year’s damage, inspect window sills and door jams to make sure no water can make its way inside. In the event of an emergency, it’s a good idea to pack an emergency kit which you can find more about here, along with an emergency plan to help you and your family stay safe. We here at SERVPRO of Lake Worth/Benbrook know the importance of making sure everyone stays safe during severe weather situations, which is why we go on storm to help those in need. If you’ve been hit by a recent storm event, give us a call today at 817.560.3086. Commercial Water Damage? We can handle that! Short of a fire or natural disaster, floods are the worst thing that can happen to your office or business. It can affect your employee’s productivity, which in turn can mean lost revenue for your company. We know how incredibly frustrating that can be as a business owner or manager. We’ve been there before, after all! That’s why we here at SERVPRO of Lake Worth/Benbrook work as hard as possible with specialized equipment to make sure that the drying process is quick and easy so you and your employees can get back to work as quickly as possible. We work hard to make sure the process is streamlined and you know what’s going on every step of the way. The boys (and ladies!) are back in town! After a long three weeks on the road in both Wisconsin and Chicago, our full team is back and ready to roll here in DFW! With the possibility of more storm events coming for the north, the team is already itching to get out into the field and having a blast with the customers up north. We love meeting and helping new people. Stories of meeting customers and their experiences on the road never get old to us, especially when you’ve got a team like ours. Where humor is just waiting around the corner at every turn, and stories keep us laughing at our quarterly dinners for hours. We are proud of our team for doing all that they do for our customers. Good job up north, boys! Textile Cleaning? We Got That! Did you know that we can clean the clothes, textiles, blankets, and stuffed toys right here in our shop? It’s true! We are the proud owners of our very own Esporta machine, which can hold up to eight loads at a time. We use special soaps and formulas to make sure that we get everything that was affected clean. We can clean everything from soot and smoke damaged articles to water damaged things as well. We know how stressful it can be to be faced with the possibility of having to replace things, which is why we focus on restoring and not replacing, and that means all your personal belongings not just your home. We aim to make it “Like it never even happened.” Give us a call today at 817.595.2506. We’ve got restoration down to a science – truly. We use formulas and chemistry every day to dry, treat, and clean homes and businesses that have been affected by water damage, fire damage, mold remediation and biohazard damage. That also means our staff must be highly trained to tackle anything that gets thrown our way. That’s why we’ve developed the National Training Center at our national headquarters. It teaches every aspect of the restoration and mitigation process from start to finish. The coolest part? We’ve got a full sized, house in our training facility. We flood it, set it on fire… you name it, it’s probably been done. Every scenario, we’ve tested the best ways to tackle the situation at hand. This is Shane and Angie Parish. 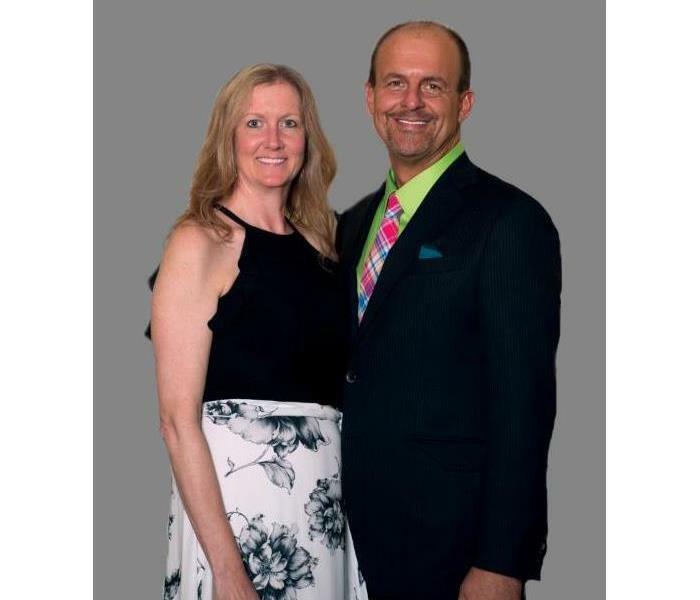 They are our owners and fearless leaders here at SERVPRO of Lake Worth/Benbrook, and we want you to meet them! They’re originally from Ohio, before moving down here to Texas to open our three SERVPRO franchises. They are our fearless leaders here at SERVPRO and without them we all wouldn’t be here! They make sure things are running as smoothly as possible, and they are driven to succeed themselves and push all of us to succeed and do our very best as well. Angie is certified in WRT as well as Lead Renovator Certified, while Shane is certified in WRT, CDS, ASD, Carpet Cleaning, Tile Cleaning, LLRT, Time & Materials, and FSRT. So, with them at the helm, we are seriously qualified to handle whatever problem you may have! Flash Floods and heavy rains can cause huge issues in Fort Worth, Texas. Always be prepared with your emergency kit! In Fort Worth, Texas, weather can change at the drop of a hat. Keeping an emergency kit in your home, car, and/or business can help you get through the disaster unscathed. Fort Worth sees all kinds of disasters from floods, to ice storms, to tornadoes. Check the list below to see what you should include in your kit. Water: One gallon of water for each person per day. This should be enough for both drinking and hygiene such as brushing your teeth. 3 Days is a good amount to be prepared for. Food: Make sure you are packing non-perishable food items. Again, a 3-day supply is ideal. Make sure you are storing these items properly… Nothing takes a situation from bad to worse quite like food poisoning. Flashlight: A powerful flashlight can be a lifesaver if your power is knocked out during a flood in Fort Worth. Make sure you also pack extra batteries if your light is not a hand crank flashlight. Battery-Operated Radio: Cell phones are a great tool for receiving information quickly, but if the power goes out, your cell phone is likely to die as well. Radios are one of the best ways to make sure you are up to date on all emergency information in Fort Worth, Texas. Be sure to pack extra batteries for your radio as well. First Aid Kit: A first aid kit can seem like a lifesaver, even when you need something as simple as a Band-Aid. These kits are relatively easy to assemble yourself, or you can order one on Amazon, or just pick one up from your local Fort Worth Walmart. Tools: A simple toolkit is something every household should have. This way you can take care of some issues yourself while you wait for the flood water to recede or the ice to melt so that you can get a professional in to tackle the problem. Medications: Always be sure you have your prescriptions on hand. It is also a good idea to pack basic medicine for headaches etc. as well. Baby and/or Pet Supplies: Make sure you have everything you need for each member of your family. Diapers, formula, pet food, and anything else you need to make sure everyone is taken care of. Cash: Cards don’t always work in an emergency. Cash is a surefire way to make sure you can pay for the things you need in Fort Worth. Important Documents: Depending on the situation, you may want to make sure that you have birth certificates, social security cards, insurance cards, etc. with you. Sleeping Bags/Blankets: If the power goes out, you will not be able to regulate the temperature in your home or office, and if you are in your vehicle, you may be stranded somewhere. Keeping a sleeping bag or blankets in your car can help keep you warm even if it is cold and gross in Fort Worth. Change of Clothes: A change of clothes can feel like a life saver if you have gotten the clothes you are wearing wet or soiled in some other way. Pack a few extra shirt and undergarments if you know you will be traveling or away from home in potentially hazardous conditions. Always remember to bring a jacket as well, Fort Worth may be hot most of the time, but it can get chilly when the sun goes down. Even though the SERVPRO® First Responder Bowl fell victim to some bad weather, SERVPRO® still works to support our first responders. Guns and Hoses is an organization in North Texas that is dedicated to helping the families of fallen first responders who have lost their lives in the line of duty. 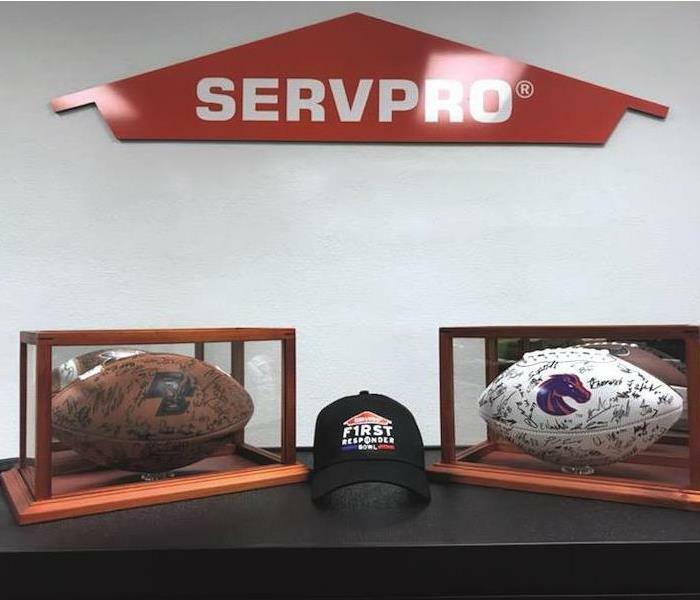 SERVPRO® of Lake Worth/Benbrook wants to help them in their mission, so while we were at the game, we raffled off 2 signed footballs to raise money for this incredible organization. Both Boston College and Boise State fans were eager to support the cause and enter to win a keepsake from their favorite team. In the end, we raised over $500 to help Guns and Hoses on their mission. Thank you so much to everyone who bought a raffle ticket to donate to this amazing cause. 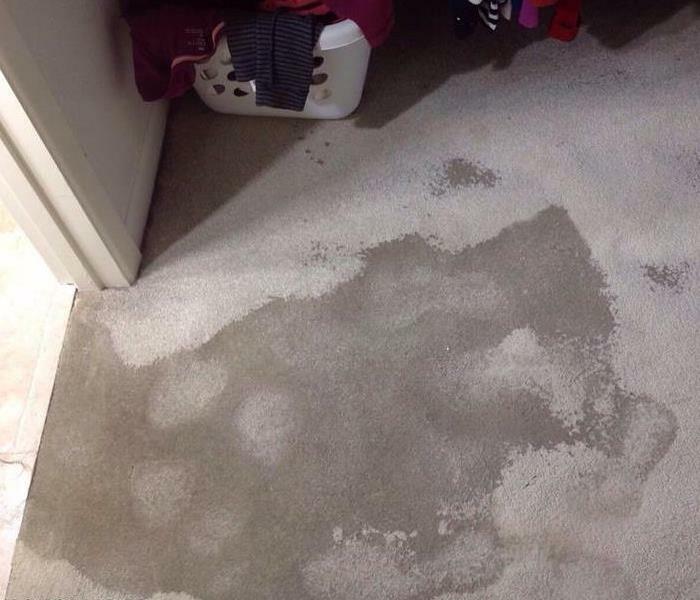 Water Damage: water seeping across floor and saturating carpet in Fort Worth home. Here at SERVPRO® of Lake Worth/Benbrook, we know a fast reaction is a key part of preventing water damage, but what happens if you don’t take care of the water right away? Check out the timeline below to see what happens when water damage is left unchecked. Water spreads throughout the property and saturates all surfaces it comes into contact with. It is absorbed into carpets, walls, etc. Furniture finishes may bleed, or other dyes may begin to run and stain other surfaces. Photographs, books, and other paper goods begin to warp. Drywall begins to warp and break down. Metal begins to tarnish & other furniture begins to warp and crack. Mold may begin to grow. Restoration time and cost increase dramatically. Serious health risk posed to building’s inhabitants. Flooded storeroom needed water extraction and equipment placed to completely dry out. This commercial retail space started experiencing flooding during a period of extremely heavy rain in North Texas this year. Water was coming into the store from multiple points, some of which the store was unable to locate. Multiple areas were showing water damage from warehouses to storerooms, and even areas that customers needed to walk through! For safety reasons, it was important to get rid of the water as quickly as possible. Once our crews got on site, they were able to determine that some water was likely leaking up through the floor because of possible foundation issues. The crew got to work right away extracting the water and setting up equipment. Once we had taken care of the standing water, we were able to set up air movers to dry out walls and other surfaces. The store was extremely pleased with our work as we helped them get through a stressful rainy period. 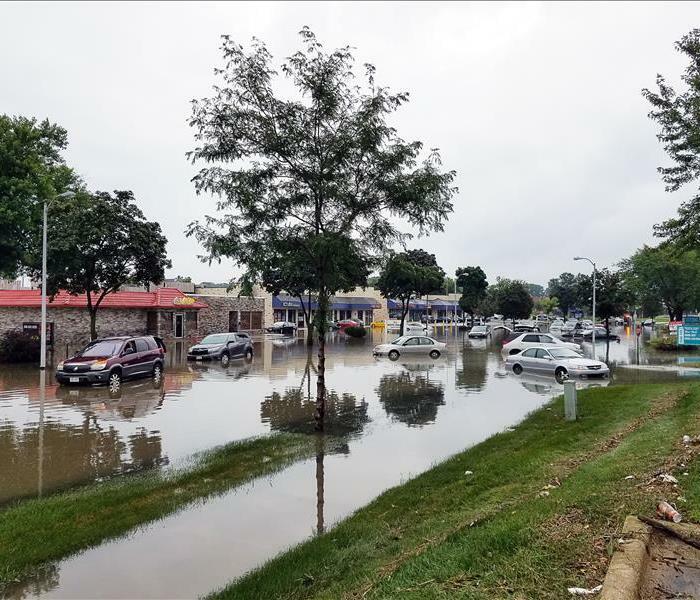 3/5/2019 - Commercial Water Damage? We can handle that! 2/27/2019 - The Team Is Back! 2/27/2019 - Textile Cleaning? We Got That! 2/12/2019 - Meet The Owners!